Having spent the last two months of 2010 creating nothing but Christmas cards and travelling round the country I thought it was time to get going again with my craft hobby. 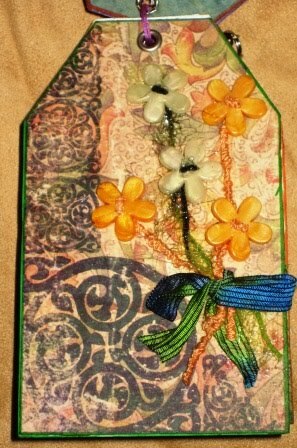 I made the following tag book for the group Art 'n' Soul. The only stipulation was that it be 4 tags with button/buttons on each side. 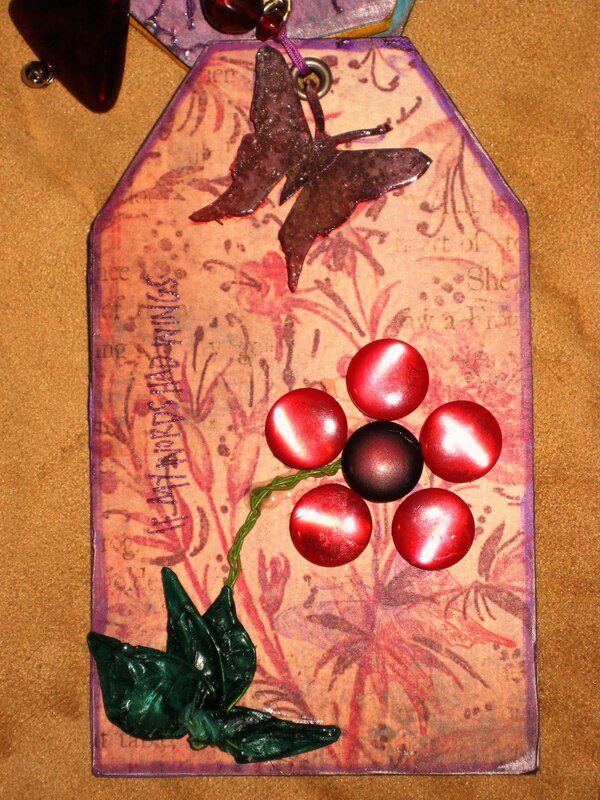 The front has "If my words had wings" saying stamped on this pretty paper then a button flower added with stems made of wire and the leaves filled with green tissue paper soaked in collage medium, I will use this technique again the result is great. The stamped butterfly clear embossed and cut out and is mounted on foam squares to give a 3 dimensional look. The edges of the tag are rubbed with metallic rub-on. 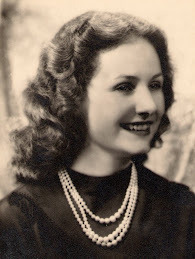 the rest of the saying "they would fly to you each day" was stamped and clear heat embossed on the reverse side. 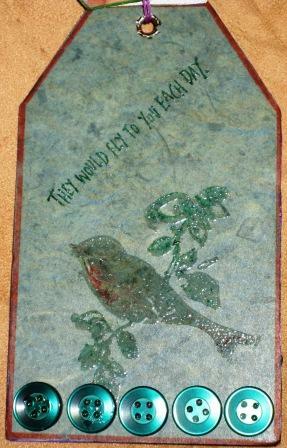 The bird stamp I inked with felt pens so that I could get a red breast to the bird, and clear heat embossed. The next tag used a beautiful paper that needed little to embellish it, so I added some flower buttons threaded with corded ribbon for stems and tied together into a bouquet with contrasting ribbon. 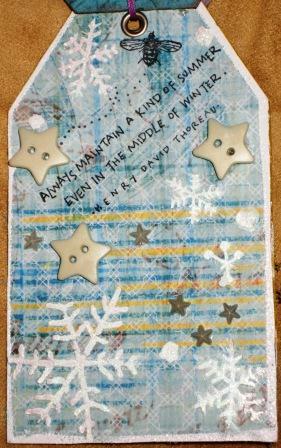 the diamond shaped paper on the next side was dry embossed and highlighted with rub-ons. 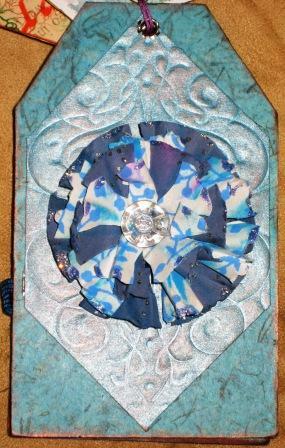 A paper flower made from cut and twisted contrasting papers and clear button was added to the center. For the next side a bee on this stamp represents summer in the middle of a this snow storm of gems, rub on snow flakes and silvered buttons. 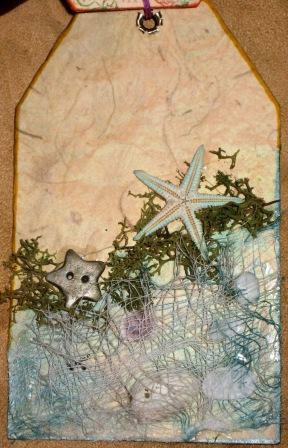 The sand and sea tag has muslin net inked with aqua and shells, seaweed and starfish are trapped within it. 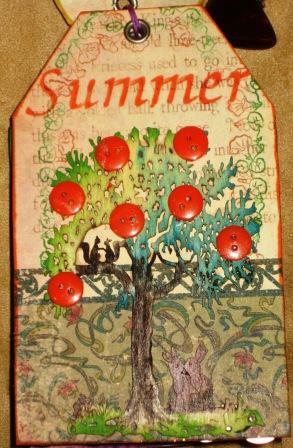 For the next side I stamped and stencilled this pretty paper tag and mounted an ink coloured wooden tree with buttons for oranges. The back tag is stamped and heat embossed with clear powder. 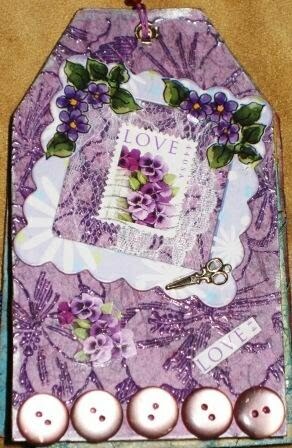 A frame lined with lace was added and stickers, stamps and tiny scissors coloured with silver rub-on placed around it. I fastened the tags together using a charm leash threaded with beads. Very beautiful tags! My favourite is nr 4 with the snowflakes. Wish you a happy creative day!